René Oosterlinck, ESA’s director of the Galileo program and navigation-related activities, and Jean-Yves Le Gall, chairman and CEO of Arianespace, signed the launch services contract in the presence of Paul Verhoef, manager of satellite navigation programs at the European Commission. The four in-orbit validation (IOV) satellites will be placed in a circular orbit at an altitude of 23,600 kilometers. 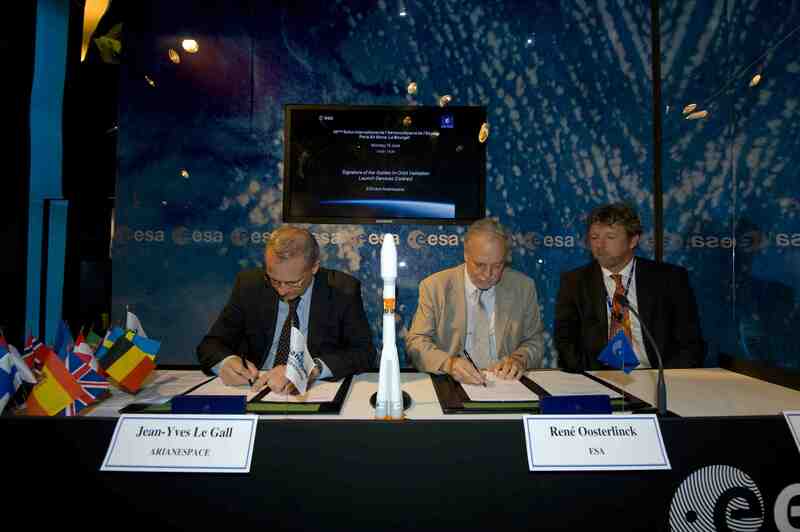 Development of the Galileo system is being carried out under a joint ESA/European Union program. The launch vehicle chosen to carry the four Galileo IOV satellites into orbit is the Soyuz ST-B with a Fregat MT upper stage, which has been adapted for the deployment needs of the Galileo program. Oosterlinck also signed two separate contracts — with Astrium GmbH and OHB — to begin the procurement of components such as flight management computers, attitude control systems, and atomic clocks — that take a long time to acquire and need to be ordered early to prevent program delays. Reinhold Lutz, senior vice president for navigation, signed the Astrium GmbH contract, which amounts to €7 million (US$9.73 million. OHB CEO Manfred Fuchs signed his company’s contract, which amounts to €10 million (US$13.9 million). ESA expects to reach a decision on the overall contracts — to OHB, Astrium, or both — for 26 FOC satellites by the end of 2009. The award of two long-lead contracts may indicate a desire to follow a dual-source strategy in building the Galileo space segment.